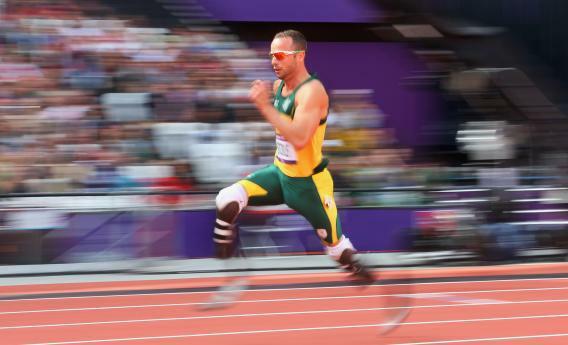 Oscar Pistorius Olympics 2012: Do the Blade Runner’s artificial legs give him an unfair advantage? Oscar Pistorius Advances in the 400 Meters. Do the Blade Runner’s Artificial Legs Give Him an Unfair Advantage? Oscar Pistorius competes in the first round of the 400 meters at the 2012 Olympics. Photo by Alexander Hassenstein/Getty Images. South Africa’s bilateral amputee sprinter Oscar Pistorius finished second in his heat in the 400 meters earlier today, advancing to tomorrow’s semifinals with the first round’s 16th-best time. The 25-year-old Pistorius, who ran a time of 45.44 in the first round, will likely have to improve on his personal best of 45.07 to make the final. Even if he doesn’t get through, he’ll run again this coming week as part of South Africa’s 4-by-400-meter relay team. And Pistorius, who won gold in the 100, 200, and 400 at the 2008 Paralympics, will also compete at the 2012 Paralympic Games, which begin later this month in London. It seemed for a time that Pistorius wouldn’t get the chance to pull off the Olympics/Paralympics double. In January 2008, he was banned by track’s international governing body from running against able-bodied competition, with the IAAF arguing that his artificial legs gave him a biomechanical advantage. But a few months later, the Court of Arbitration for Sport overturned that decision, saying there was no proof Pistorius had an unfair edge. That opened the door for Pistorius to run against all competitors, no matter their lower body type. With both studies in hand, the CAS ruled that the Germans had only looked at Pistorius’ possible advantages—his straight-line acceleration—rather than weighing them against the disadvantages his legs might confer—the speed at which he comes out of the starting blocks, for instance. (To wit, only four of the 47 men who made it through the 400 meters on Saturday had a slower reaction time than Pistorius.) The CAS also said that the fact no other amputees had run as fast as Pistorius demonstrated “that even if the prosthesis provided an advantage … it may be quite limited.” But the court did leave open the possibility that, “with further advances in scientific knowledge,” Pistorius and his Cheetahs could be re-evaluated down the line. Eveleth finishes her story by noting that to “complicate matters further, science doesn’t totally understand how running works.” Well, great! But in the end, with leg technology in its current state, it’s hard to argue that allowing Pistorius to compete does anyone any harm. What could Pistorius potentially accomplish? At the end of the Scientific American piece, a physiologist raises the tantalizing possibility that, because “Pistorius’ Cheetahs don’t tire,” the South African might be the best in the world at the 600 meters if such an event existed. So what’s stopping us? Let’s get the 600 meters on the card for Rio.